Betty Gilpin joined her co-stars for the LA premiere for ‘Isn’t it Romantic’ on Monday (February 11). 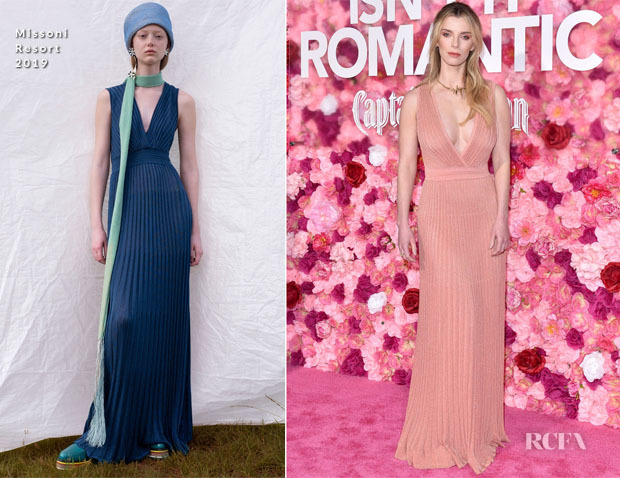 I’m tempted to say that I wish she had worn the blue version of this Missoni Resort 2019 pleated dress, but the peach hue sits firmly in line with the soft, delicate theme that was present on this red carpet. Having said that, my overriding feeling is that something’s missing from this look.